Obese people do not just risk their own health; their health problems cripple the economy. GDP would be given a boost if the number of fat people fell sharply. The Obama administration has not made an attack on obesity part of its stimulus program. Maybe it should. 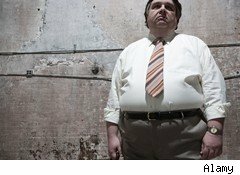 Gallup researchers report that "Full-time workers in the U.S. who are overweight or obese and have other chronic health conditions miss an estimated 450 million additional days of work each year compared with healthy workers - resulting in an estimated cost of more than $153 billion in lost productivity annually." The obesity epidemic raises health care costs, which get passed along to insurance companies and the families of the obese. The loss of productivity pressures corporate profit margins, which are already pressed by a weak economy. Obesity is one of the few things damaging the economy that could be changed. The obese are not expected to carry their own weight in terms of what they pay for insurance. They cost the system more, so they should pay more into insurance pools. That would give those who are overweight some incentive to lose weight. Of course, the other side of it is that anyone who has to pay more for insurance has less discretionary income. For obese people that means less money for food and drink. Insurance company earnings and general productivity would be helped by a drop in the number fat persons. Fast food chains like McDonald's (MCD) would be hurt. It is hard to calculate, on balance, how much a drop in fast food sales would hurt the overall economy. Obesity is one of several things that costs society money and are based on decisions made by individuals. Drug use, alcohol abuse and smoking are among them. There have never been any financial penalties for these habits beyond sin taxes. The government and many companies have budget problems now. It is not obvious to most that the habits that cause obesity are part of the problem. Tax the obese and the government makes more money. Or, people go on diets and become more productive. Methodology: These findings are based on Gallup-Healthways Well-Being Index data collected between Jan. 2 and Oct. 2, 2011. Gallup surveyed 109,875 full-time employees - those who work at least 30 hours per week - during this time period.